Come join us for another great year! June 30, 2018 is the end of our 2017-2018 fiscal year, and this is the time for you to renew your memberships for the 2018-2019 year! Your membership can be renewed at our July picnic on July 8th at White Pines Lake, so bring your checkbook or cash! up to a maximum of $500 in matching funds. At our Annual Season Kickoff Potluck in September 2018, our Ski Club donated $210 to BVSF! Or send your completed BVSC Membership Form along with your check made out to the ‘Bear Valley Ski Club‘ to Julia Prehm, our Membership Chair, at the address as shown on the Membership Form. Annual dues are $35 for a family membership and $18 for a single membership. Late dues are $45 for family and $25 for single memberships. This is a late fee, not an increase in dues. Get your dues in now to avoid late fees! New members joining after December 1st are NOT subject to late fees. Want to have more fun in our Ski Club? Then volunteer as a Board Member or as a member of one of our Ski Club’s committees! It’s a great way to meet more Ski Club members, and have more fun. 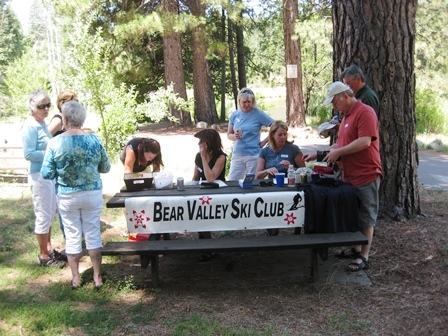 Contact us at info@bearvalleyskiclub.com for more info. Our Ski Club is an all volunteer organization and we need YOU! Let us know if you are willing to be an “activity” coordinator! Don’t forget that we are an all volunteer organization! Don’t forget to subscribe to our Ski Club emails. You don’t want to miss any news or info about upcoming events!